Thanks for doing this – I’d been thinking the Spencer and Braswell analysis ought to be looked at in more depth (ha, pun intended 🙂 but just haven’t had the time, your approach here is more than I would ever have done anyway, so double thanks! An unexpected but welcome pre-Christmas bonus. Thanks SoD, your thoughtful investigations are always illuminating. Thanks SoD, good to see you managed to find the time to write a new post. Merry Christmas, by the way. Thanks for continuing to look into this issue. I must say, the more I read Murphy and Forster (2010), the more curious their choice for this ocean mixed layer depth seems to be, since it is derived for longer time scales. The idea in Spencer and Braswell (2008) is that unknown radiative variations influencing surface temperatures within the short-term (e.g., a few months) will contaminate the estimate. 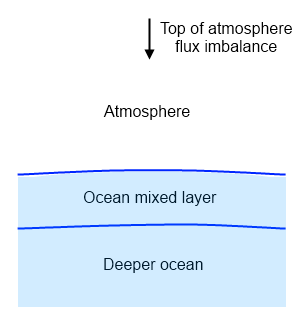 That this heat in the mixed layer may later be transported slowly to the deeper ocean over the course of a decade (or more) is largely irrelevant* — the primary thing that matters with respect to the contamination is the initial damping (which would relate to the effective MLD for sub-annual timescales). The whole 80-year simulation part seems largely a red herring. For a deeper MLD to be relevant there would need to be a much longer time lag for the initial surface temperature response to a forcing, in which case it would likely exceed the decorrelation time of this radiative noise anyway. I tried to estimate this “effective” global mixed layer depth using sea surface temperature fluctuations and Argo OHC observations, and came up with about 60m for 3-month timescales, close to your area average. 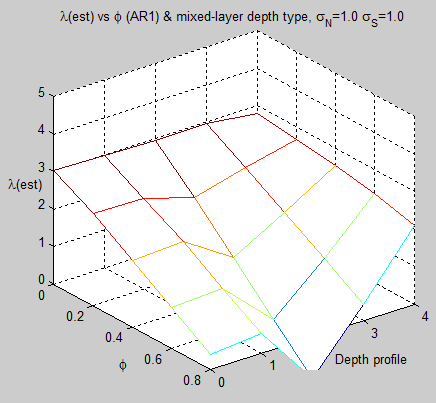 Your work examining a varying mixed layer depth is quite interesting, although if you’re moving into the horizontal realm, it seems like equally important might be the location of the flux variations (rather than N being distributed evenly across all latitudes). *I say “largely irrelevant” because theoretically the heat transport resulting from previous changes in forcings could serve to decorrelate more recent forcing effects on the surface temperatures. 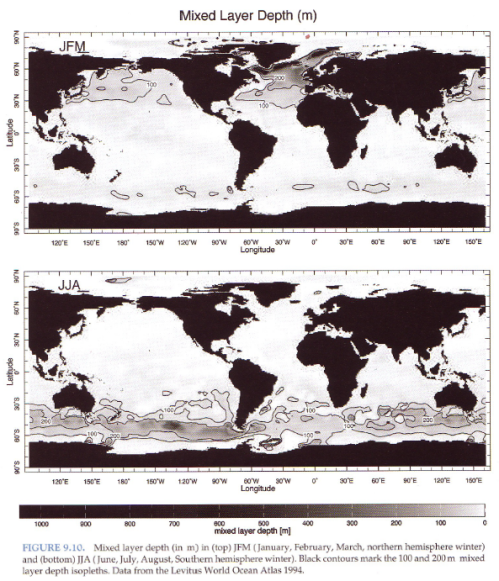 There are a few decades of history on this topic (the “right” ocean depth), for example Climate response times: dependence on climate sensitivity and ocean mixing, J Hansen, G Russell, A Lacis, I Fung, D Rind, Science (1985). I think this paper might be free if you register with Science, if not I can email you a copy. Many other papers also on this topic. 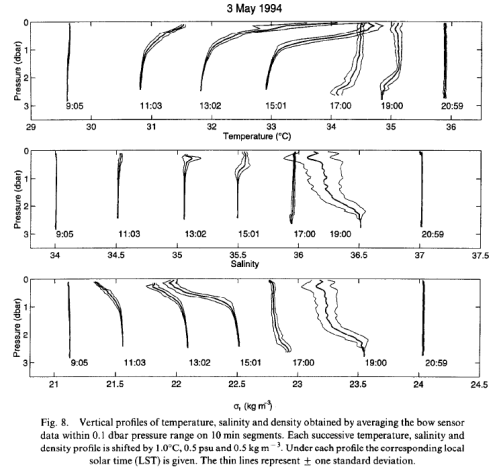 I can conceptually see why running the model over a longer time period requires a “calibration” due to heat “leaking out” into the deeper ocean. It would be amazing though if somehow just changing the depth made the model work perfectly. And at the same time my conceptual thinking might just be plain wrong, in the way that you describe. 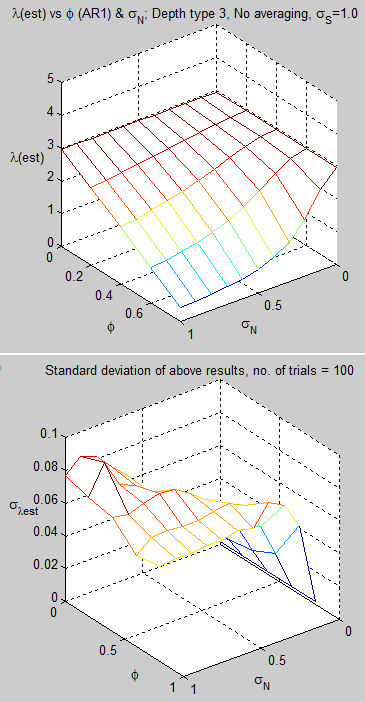 That’s why climate sensitivity measurement problems (CSMP – a new acronym) has to be tested with a better model that actually uses realistic heat flows via (at least) a 1-d model. Or solved analytically (good luck anyone trying that). Your other points are also valid -e.g., matching up the actual flux variations with the correct depth values. One slow step at a time for me..
One problem is that climate sensitivity itself averages over a ton of detail so using parameters that are averages makes sense. The caveat is that the average may have to be a weighted average and not a simple one. Interesting article, but have you considered that the 3C of change in global average temperature that occurs every 6 months (twice a year) does not support a time constant of 4+ years? A time constant of 4 years requires a response time of about 20 years. After 5 time constants, over 99% of the final effect has occurred, right? The +/- 3C change (-3C in January) only occurs from about a +/- 8-10 W/m^2 forcing from perihelion to aphelion, where the maximum post albedo (+8-10 W/m^2) occurs in July rather than at perihelion in January because the albedo is largest in January as a result of the accumulated ice and snow from the northern hemisphere winter. Spencer and Braswell’s 50m mixed layer would seem to be very consistent with this. You claim in the post following this one (comments are closed) that I consider quantum mechanics to be a mistake. This is not a correct description of my position. I consider the statistical Copenhagen Interpretation to be non-physical as did Einstein and Schrodinger, but there may be a version of quant mech which is free of statistics and which is not a mistake. I hope you will correct your mistake. Einstein and Schrödinger were wrong. Spooky action at a distance (quantum entanglement) does happen. And it is, in fact, random rather than having been defined when the the photons were generated. Lubos has a post about Steven Weinberg, who admits that quantum mechanics is spooky, thus in support of E and S.
1. The quantization of certain physical properties like charge and spin. 2. Wave-particle duality as evidenced by electron diffraction and the photoelectric effect. Claes, Thanks for stopping by. I have added your comment to the article to clear up any confusion. Although I’m sure you know that most of your internet climate fans have no idea what your theory actually entails. At least the clarification is there for all to ponder. If anyone has collected daily CERES measurements (TOA flux) and has them available (in something like .csv or Excel) please let me know. Even better, if someone has a utility to convert .nc files into csv or another readable format, please let me know. (I have a Windows 7 machine). I have downloaded CERES data from the website but it is .nc. Another voyage of discovery.. I found that Matlab has some utilities for extracting netCDF data (= .nc file type). Matlab utilities mostly refer to “the user documentation on netCDF” rather than explaining what is going on. Which is fair enough, except the user documentation is like reverse engineering because there is no human readable “header” for my .nc file. The documentation shows file structure in human readable form, but the files are not readable so it doesn’t help. I can’t see the structure of my file so have no idea whether my file is slightly different from their example or a whole different world. Is there a converter for the header into human readable form? (Opening in a text editor doesn’t do it). So rather than grasp the possibilities of the complex self-describing data structure, I just want to extract my data.. I downloaded some data from CERES for a small set of 1’x1′ cells for 3 TOA fluxes (net, lw, sw) over 31 days. I can “get some data” for each one of these variables but don’t want to assume I have correctly extracted data. Anyone else made this journey? R has a package (ncdf) that makes reading NC files pretty easy. I’ve put the daily global averages for lw, sw, and incident solar (starting 3/2000) up at http://dl.dropbox.com/u/9160367/Climate/12-31-12_CERES_Terra_daily_avg_03_2000.txt in a format that’s easy to read, if you want to use that. Basically, I’ve just used a weighted-average of the SSF1 degree cells and ignored any blank data. 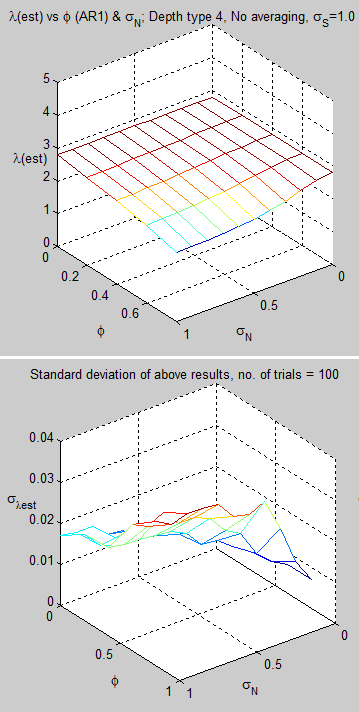 A bias could creep in depending on if there is a trend in the areas with missing data, since I don’t try any interpolation. Even excluding this blank data, there are a few days that are clear outliers that you may want to exclude. The R script is up here in case the Matlab commands are similar (I had to download the data in 2 chunks since 1 was greater than 2GB). Since writing my comment I have managed to do some extraction of CERES data then area weight to get daily averages. But there are data quality issues, where -999 seems to be used for missing data. So I have been experimenting a little with just ignoring negative values, also with the “trimmed mean” function in Matlab that calculates the mean after ditching a user defined % of outlier data. I’m sure there are documents on best practice using CERES data, needs some digging..
I’ll now take a look at your data and see how it matches up with what I have. Maybe I will start an article on this subject to capture what we have learnt and display some results. BE ADVISED HEREWITH that lawyers will be engaged to file for defamation if the front page item about myself is not removed by midnight your time on 31st December, 2011. Doug: My interest in climate science began with a single stop at RealClimate – where I saw some ridiculous excuses for the poor science in Al Gore’s movie and scathing comments about some “moron” named McIntyre. I needed to find out what that McIntyre fellow was selling that was so awful and I certainly found out. After reading ClimateAudit for a year or two, McIntyre’s positive comments about SOD sent me here. I haven’t followed your debates with SOD, but I did follow the link he provided to your site, where I clicked on a few of your references. SOD’s post was free advertising for your website. The more frustrated and injudicious SOD may have been in the now delete post – the better the advertising. Now the link to your site is gone. Oh well, I didn’t see anything at your site that others will miss. I found the above comment in the spam queue when I was checking through it. It’s unclear to me what kind of defamation it contains, but not being much of a legal person and not being at all interested in Doug Cotton I think, why not remove the page? Farewell, young page, you will not really be missed. SOD: I read through some of the Montegut paper on the mixed layer and ended up more confused than before. There may be several different types of “mixed layers”. 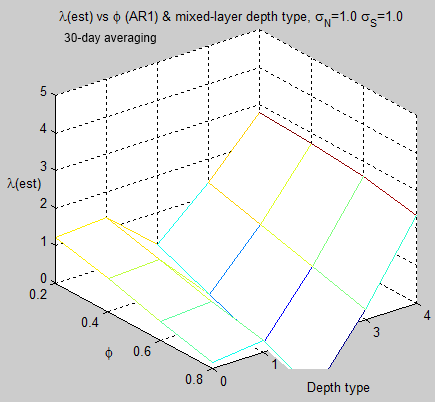 The mixed layer that is relevant to S&B presumably is the amount of water (depth times fixed surface area) that responds to a change in forcing applied over a given period of time. When Mt. Pinatubo erupted and SWR was reduced for 1-2 years, how deep in the ocean did the temperature change? How deep does one have to go in the ocean before there is no seasonal temperature difference associated with seasonal differences in solar forcing? There’s no perfect answer to questions about the mixed layer, because there isn’t a boundary where layer turns from mixed into not mixed. So “negligibly” is just a condition that needs a definition. How deep does one have to go in the ocean before there is no seasonal temperature difference associated with seasonal differences in solar forcing? Interesting question. Not sure of the answer to this. I have a nice graph in Marshall & Plumb (2008) of surface temperature and 500m temperature at 50’W and 30’N (Atlantic Ocean). The 500m temperature shows no seasonal change. But that’s just one location. Turbulent mixing will certainly produce energy transfer, but does energy transfer require turbulent mixing? Thermal diffusion and molecular diffusion provide mechanisms for energy transfer and “homogenization” which are DRIVEN by non-homogeneity, but these may be too slow to be relevant. Are there any other mechanisms that lie between these two extremes? Moving fluids against their buoyancy gradient requires energy from somewhere. In the case of daily mixing, the mechanism is night time cooling that changes the buoyancy gradient so that denser fluid is above lighter fluid. With wind-driven mixing the energy comes from momentum transferred from the wind to the ocean surface (and easily demonstrated via temperature profiles during the day vs wind speed). In the deeper ocean the mechanism is the breaking of internal waves. Smooth sea floor geometries have lower vertical eddy diffusivity above them compared with rough sea floor geometries. 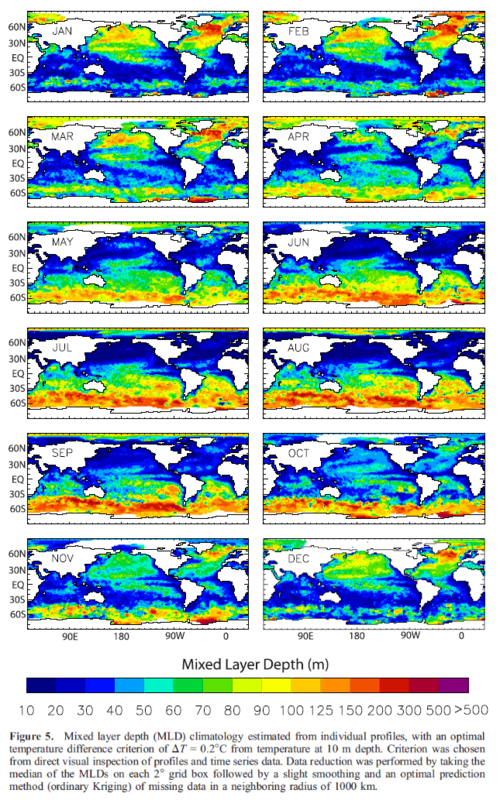 Diffusion is too slow to explain the temperature profiles seen in the ocean. 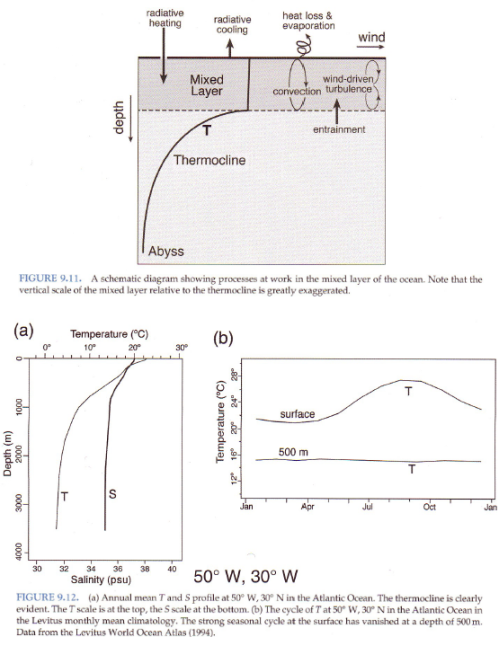 The graph that I mentioned of temperature change at 500m is b) of Fig 9.12 in my figure 2 in the article above. 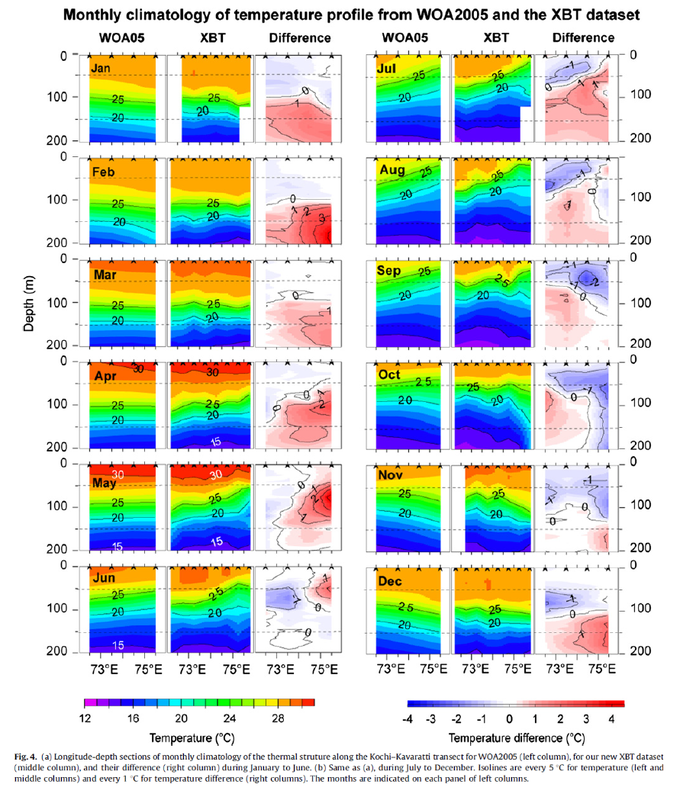 Observed intra-seasonal to interannual variability of the upper ocean thermal structure in the southeastern Arabian Sea during 2002–2008, Gopalakrishna et al, Deep-Sea Research I (2010). SOD: Thanks for taking the time to post some interesting data. Since this data is from 10 degN (see Figure 1, http://drs.nio.org/drs/bitstream/2264/3631/3/Dee-_Sea_Res_Pt_I_57_739a.pdf), the temperature changes are complicated by other factors beside the seasonal change in solar forcing. The location is also near land, so changing currents, winds and upwelling/downwell can be influencing the temperature profile. However, it does look like the annual peak in water temperature in March extends below 100 m in this location and extends well below their definition of the mixed layer (within 0.5 degC of SST). Outside the tropics, if the mixed layer warms 5 degC during summer, there must be some warming in the steep thermocline underneath or there will be a discontinuity which can be smoothed only by diffusion. 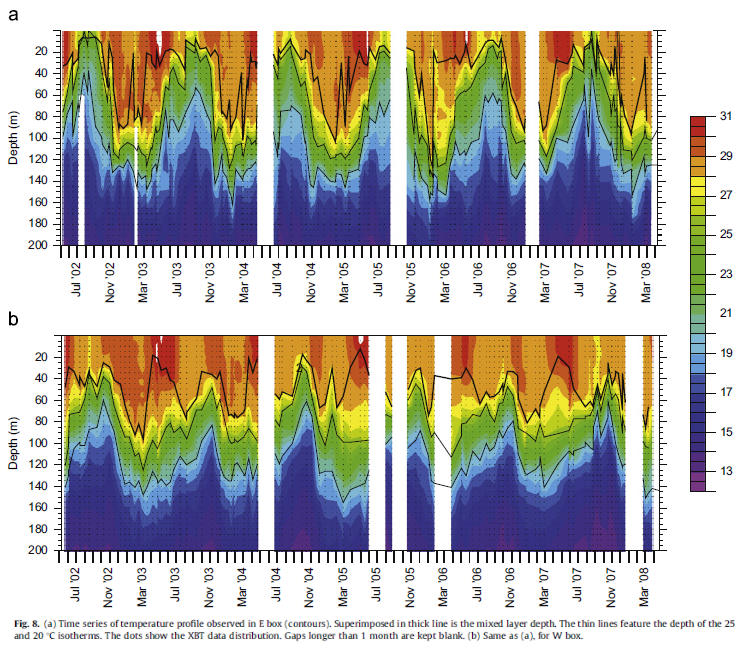 The (old) paper below suggests that nighttime convection deepens the mixed layer in the autumn when SST is falling. Radiational heat losses during the night or during autumn will be associated with penetrative convection which mixes heat from near the surface into lower layers. The depth of the thermocline can be influenced by the amplitude of daily, synoptic and seasonal fluctuations of cooling and heating at the surface, as well as by variations of wind stirring. We conclude therefore that the penetrative radiation produces convective mixing at a rate which is of the same order as that produced by mechanical stirring and that during the height of summer the radiation effect is likely to be predominant. The aim of this study is to see how well models might predict sea-surface temperature throughout the year, given the inputs of heat and mechanical energy into the ocean. With this in mind, curves relating surface temperature, heat content and potential energy of the top 250 m of ocean are obtained for one of the North Atlantic weather ships. 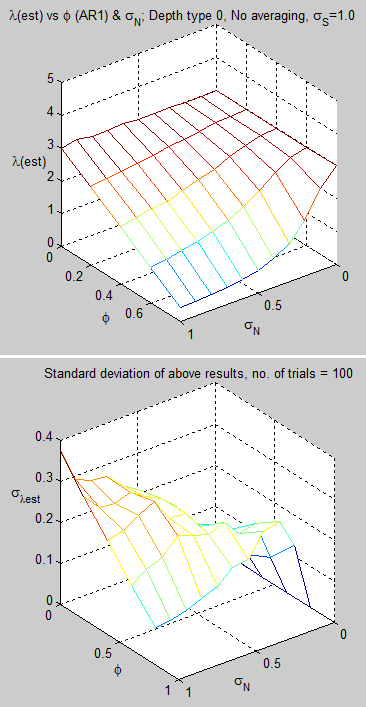 Then comparisons are made with similar curves predicted by a series of simple models. 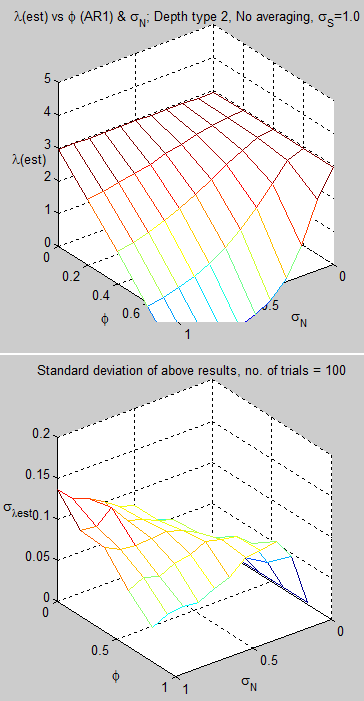 Of those tried, the most satisfactory is a modified version of the model of Kraus and Turner, where a mixed layer is produced by both mechanical and (in the cooling period) convective mixing. In the original model, all the energy made availability by surface cooling was used to deepen the mixed layer. Much better agreement with observation is obtained if this convective stirring is non-penetrative or only slightly penetrative. This is consistent with recent atmospheric observations.